Twilio Stock Is a Beast! Want in? I've got an idea. Twilio (TWLO - Get Report) reported the firm's third quarter performance on Tuesday night. Under the radar? Not exactly. They crushed it !! Despite the headline stealing U.S. midterm elections that resulted in a gridlocked legislative future, shares of TWLO ran... ran like the wind. What's that? Yes, you in the back... you have a question? Fair enough. It's easy to get lost in the ever-evolving world of technology firms with all of their catchy corporate monikers. Okay, here's the dish. It gets wonky, but I'll try to simplify for those kids out there as old as I am. Twilio, in short provides communications software. So... you mean that they're a telecom? No.... let me try again. This firm enables application developers to embed voice, messaging, video, and authentication capabilities on their own work. The firm then allows this developed software to communicate globally with both connected devices and interconnect with other communications networks. Got it? Good. The bottom line is that other firms are lining up to buy what Twilio sells. The business is growing and fast. For the quarter, TWLO beat both expectations for EPS by a nickel and for revenue on growth of 68% year over year. It gets better. Ready? The firm guided the fourth quarter revenue toward a range of $183 million to $185 million. That would be versus consensus of $160.6 million. The firm also guided Q4 EPS above guidance..
As for the quarter reported, Gross Profit Margin, Operating Margin, and active customers all also beat expectations. An additional positive would be the firm's pending acquisition of SendGrid (SEND for $2 billion in stock. SEND also broadly beat expectations on Tuesday night, though declined to provide guidance due to this coming transaction. 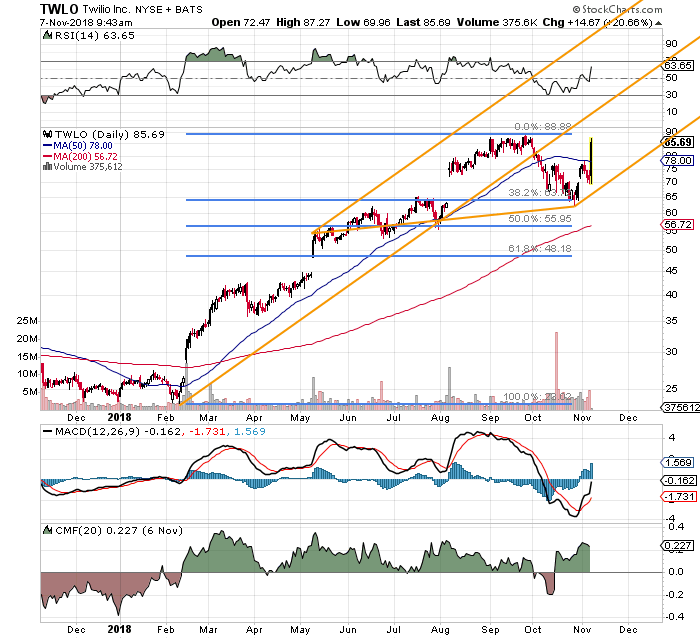 The interesting thing is that while TWLO shares were trading up near 30%, SEND shares were also trading up about 30%. Yowza. So, is it too late to get in? Probably... for now. Just take a look at the year to date chart? You want to chase this? That would be like chasing a race car. Okay, the stock is a beast, and after a nearly perfect Fibonacci bounce, now is re-testing the highs, all while at the same time respecting the Pitchfork model. Okay, the Pitchfork is a little loose. All of your other indicators are of course going to look positive on a day such as this. Still want in? I've got an idea. The firm reports again in mid-February. Obvious support seems to exist in both the $63 and $55 areas. The idea here is to capture a rough $4.13 in premiums in order to make up for not owning a stock that just ran. The risk? The trader may end up long 100 shares at a net basis of $62.19, or 200 shares at a net basis of $57.94 if the stock rolls over hard by February. Is the risk worth the reward? Quite possibly. If you're scared, only sell one series, perhaps the February $60's. Those are currently worth about $1.95. Remember, the whole idea is about risk management. You have to be comfortable with your own actions.